Cosmetic Dentistry procedures can help you achieve the look you want. Dr. Christensen practices cosmetic dentistry with cutting-edge technology, including lasers for some procedures, such as fixing a gummy smile. Because of the high-tech we use, the number of appointments needed are reduced, which makes your cosmetic treatment more affordable. A smile makeover often involves more than just a cosmetic fix-up of your teeth. It also has to take into consideration your facial structure, the overall functioning of your mouth and how the teeth should come together. Dr. Christensen works together with Dr. Messerkhani and Dr. Henriod to address more complicated issues, such as aggressive gum disease or a more complex mouth reconstruction where multiple dental implants might be needed. Dr. Vahik Meserkhani is our prosthodontist—a specialist in replacing missing teeth and restoring natural teeth to full health and beauty. He is also a highly credentialed oral implantologist. Known for his excellence in full-mouth reconstruction, Dr. Meserkhani works with Dr. Christensen on full smile makeovers. Dr. Joel Henriod is our periodontist and he takes care of severe gum disease and dental implant placement. He works closely with Dr. Christensen to bring a patient’s mouth to full health prior to cosmetic work. We put individualized attention and craftsmanship into every dental procedure we performs. When you decide that you’re ready to enhance your smile, you and the doctor will work together as partners to create a natural-looking, age-appropriate smile for you. Dr. Christensen teams up with the other dentists to give you the exact care you need. Besides low-dose digital X-rays and a comprehensive oral exam that includes a muscular system check, we will also take facial measurements, lots of digital photos and make a 3D model of your smile. Digital X-rays show about 40% of what a cosmetic dentist needs to see. The many digital photos gives us the other 60%, and with the 3D model, we is ready to plan your smile. You’ll review this model with the doctor, and then decide if that’s the way you’d like to have your smile look and if not, make changes. The choice is always yours. Whatever the procedure you decide upon—crowns, bridges, veneers, implants or laser teeth whitening—you can be sure we will ensure that you’ll completely understand exactly what to expect. We use porcelain and other materials that have the same translucent properties as natural teeth. Porcelain is also very durable. We use a shade guide to match natural teeth and we even have our own lab to monitor the quality of the final veneers or crowns: their shape, size, color and fit. Worn teeth, missing teeth or poorly positioned teeth can cause the facial structures to be non-optimum or even to collapse. 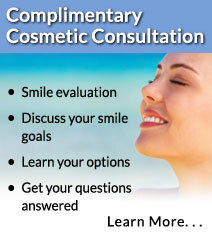 A smile makeover can give you the added advantage of a facelift! We use the latest technology to give you a beautiful smile. Cosmetic dentistry is a blending of art and science. We utilize the latest dental tools and procedures that are best suited to the condition of your teeth, your budget and your goals. Some of the procedures that we usually use in cosmetic dentistry are listed below. Click on a link for more information. Typically veneers are used to cover chipped, stained or discolored teeth, to close gaps and even to fix mildly crooked teeth. Considered a more affordable alternative than porcelain veneers, dental bonding is the application of high-grade composite material to the front of your teeth. With computerized, laser Zoom! whitening we can whiten your teeth up to eight shades in just an hour visit! We also supply custom whitening trays. We use Invisalign and ClearCorrect clear aligner systems for straightening teeth. Dr. Christensen will help you choose the system that is right for you. Crowns remedy similar conditions as porcelain veneers, with the added benefit of improving the bite when needed. Crowns are usually used instead of veneers for cosmetic purposes when the tooth is too decayed or broken down for a veneer. Dental Implants are the most natural and tooth-like replacement for missing teeth. Dr. Meserkhani and Dr. Henriod are both board-certified and do the entire procedure in-house. A bridge is another option for replacing missing teeth using porcelain prosthetic teeth supported by your own natural teeth, or implants, on either side. With our state-of-the-art diode laser, we can remove excess gum tissue to reveal more length of teeth, or reshape your gum line for a more regular contour. More durable than composite fillings yet less invasive than a crown, porcelain inlays and onlays are used for very decayed teeth or large cavities. Milled out of high-grade ceramic they are either placed between the cusps (inlay) or over the tooth cusps (onlay). A dental laser is a kind of laser specifically created for use in oral surgery or cosmetic dentistry. The use of a laser decreases pain or discomfort after surgery while reducing the need for anesthetics. Due to the cauterization of tissue there will be little bleeding following soft-tissue procedures. Veneers corrected this patient’s teeth. Crowns and Veneers fixed this patient’s smile. 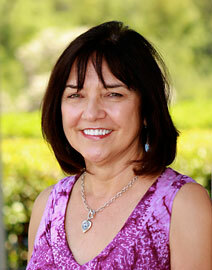 Linda has been with the practice for 34 years. As a nurse practitioner, she is particular about her choice of healthcare providers, and was very happy to have found Rancho San Diego Dental. “I feel I am receiving highly skilled, state-of-the-art dentistry. After many procedures I never dread the dentist, as anesthesia when needed is excellent, the work top-notch, and there is a genuine caring attitude. “I had periodontal work recently with Dr. Henriod. The work was as close to painless as possible. I had gum grafting in one area where my dental bridge had worn out over time. He’s seems at the top of his game and is very friendly and personable. His work is very professional and painless.